To bolster their bottom line and maintain a solid position in the market, stand-alone marijuana cultivators in Nevada, Colorado and Oregon that don’t possess retail licenses are pushing for the right to open stores or even sell cannabis directly to customers. As recreational marijuana supply increases and wholesale prices slide accordingly, stand-alone cultivators are feeling increasingly squeezed out of the market, particularly in states with license structures that allow for vertical integration. Unlike stand-alone growers, vertically integrated businesses can process and sell cannabis after they grow it. Among the states with recreational cannabis laws, Colorado, Oregon, Alaska and Nevada allow for vertical integration while also permitting single license types like stand-alone cultivation. Washington state doesn’t allow vertical integration, and California’s initial recreational regulations permit only limited vertical integration. However, there is a provision that would allow “large-scale licenses” in the Golden State in 2023. Several growers in Nevada have appealed to regulators to change state rules to allow them to also own retail licenses. They argue that vertically integrated operations are shutting them out by selling only cannabis they grow themselves. Nevada allows retailers to apply for cultivation licenses, and the state hasn’t set a limit on such permits. The growers’ concerns might be addressed this month by Nevada’s Legislative Committee. “There are a lot of cultivators in town that are scared to death if they don’t get a dispensary (license),” said Greg Nelson, co-owner of Mother Herb, a medical and adult-use cultivation company in the Las Vegas area. His company applied for a dispensary license when Nevada launched its medical marijuana market in 2013 but didn’t receive one. Nelson’s Mother Herb has about 12,000 square feet of indoor canopy. By contrast, he said, several of Nevada’s vertically integrated companies are building out 50,000-100,000-square-foot cultivation facilities. “There’s a worry that cultivation companies like mine may be run out of business because we don’t have a dispensary,” he added. Nelson’s business currently is selling wholesale indoor-grown cannabis flower for about $2,200 a pound, down from about $2,400 a few months ago. Trim is selling for about $900 a pound. He said he’s had good luck selling a high-CBD strain that’s currently in demand. Nelson expects to get another opportunity to acquire a retail license in the spring, when state regulators reopen the application process. Nevada isn’t the only state where stand-alone growers are struggling. Other adult-use states with vertically integrated companies are hearing similar complaints. “If cultivators are going to stay in business, (direct sales are) going to have to happen,” said Sam Thoman, chief of business development at Strawberry Fields, a vertically integrated company based in Colorado Springs, Colorado. Strawberry Fields has a 2-acre greenhouse. “The only reason we’re safe is because we have eight storefronts,” Thoman said. Last year, Strawberry Fields could wholesale a pound of greenhouse-grown flower for $1,500. The company’s currently getting $600 a pound because of overproduction in the state. Even though Strawberry Fields is vertically integrated, Thoman said, he’d welcome the ability to sell directly from his cultivation facility. “As opposed to selling a $600 pound, we’d love to have someone just drive up to the gate and be able to buy a $100 ounce,” he said. “We’d get $1,600 for that pound. Strawberry Fields puts its own twist on that situation. The company wholesales cannabis it grows to other retailers while buying pounds from stand-alone cultivators for $500 to sell in its stores. 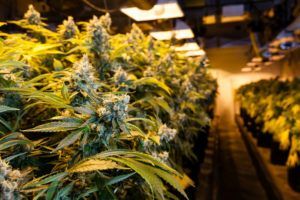 The high number of Colorado cultivators with greenhouses who are competing against each other and don’t have retail licenses are driving down prices, Thoman said. “If you don’t have shelf-space-to-consumer (sales), you pretty much don’t have an outlet,” he added. Depending on how well a cultivator manages input costs, a pound of greenhouse-grown cannabis can cost about $300-$500 a pound to grow, according to Thoman. “We’ve had people contact us and try to sell us pounds, and we’ve had to turn them away,” he said. “Right afterward, they’ve basically asked if we want to buy their greenhouse. Thoman’s reaction to the market is to buy more retail stores, not invest in greenhouses. Some cultivators who can’t find places to sell their cannabis have actually approached Thoman about the prospect of partnering with Strawberry Fields to buy retail stores. Selling directly from cultivation facilities to the public likely won’t work in Nevada, Nelson said. In other cannabis states, specifically those with fertile grape-growing regions such as Oregon, comparisons have been made to the wine industry, where customers can buy bottles of wine directly from the vineyard. “I don’t think that’s a good idea,” said Aviv Hadar, who owns a vertically integrated cannabis business in Bend, Oregon. He’d like to see audits and inventory and compliance responsibilities remain at the retail level. But William Simpson, who owns a vertically integrated cannabis company in Portland, Oregon, doesn’t see why it would matter. “I see that as a fine opportunity,” he said. “We want to normalize cannabis, right? “Why would it be any different than beer or wine? You can go right to the vineyard who grew the grape and buy the wine. (Or) you can buy it at a restaurant or a bar or a wholesale retailer. Top shelf indoor is $1000 a pound and dropping in Oregon. $30 for top shelf 1/8th after tax. And the OLCC is only half way through the cultivation license approvals. Indoor will drop to $500 a pound until the swamp is drained of those who can’t afford to capitalize the losing market. The pattern will repeat in every state until it’s legalization is complete. I recommend getting a head start welcome to the race that’s been going on. The Winners are already in place in Oregon such as Chalice who sold out for $20million and the venture capitalists like Sara Batterby whom wisely have moved on to their next projects. It’s an idea whose time hasn’t come because we aren’t allowed tasting rooms, smoking clubs or cannabis bars yet. The growers will have to deal with the same drawbacks and moving goal posts as the rest of us. This reminds me of the labs who wanted special treatment to be immune from competition. Eventually grocery stores and internet sites will sell cannabis but pushing for that now will bring a community relations backlash. Yeah…plus the whole smoking era is long gone. You can’t even smoke cigarettes in a bar nowadays. Bottom line is that marijuana stinks and as such will never gain popularity with the masses. Some smart people need to take the smell out first and forget about CBDs and all that other junk. Until marijuana can conjure an image that says something other than “stoner” it’s going to have a long road ahead. CBDs are not junk. Nor are the terpenes which give the fragrances of differing strains. They are the key which will unlock the pharmaceutical properties of cannabis for medicinal use. And as awareness grows of its medicinal uses, so the stigma of it being a “stoner” plant will fade away. It has often been told, “be careful what you wish for”, and sure enough these concerns are real and now the market is speaking and now adjustments and pivots are required. If the commodity prices are dropping to the floor your choice is to “sell the farm” or differentiate. Easier said than done when you have to acquiesce to regulators – but differentiation could make people ask for you by name (King Arthur flour comes to mind). All those people pushing for legalization thinking that Marijuana was some kind of gold mine are now starting to see reality. It is just a simple plant that anyone can grow. The price of Marijuana should be and will be no different than tomatoes with the added cost of regulation and tax. From a monetary viewpoint, it would be better if kept illegal. The prices would have stayed high. It’s not even comparable to alcohol. I can’t make a bottle of Jack Daniels but I can make the exact same Marijuana sold in the shops. Amen Hastings. The rush to the pot gold mine was/is just that, a rush. Lots of talk and big plans and investment over something that has been home grown or black marketed for years and worked fine. Big investments won’t pay off because govs are making it too expensive with taxes because they are losing their other cash cow, law enforcement funding, jail funding and the whole criminal justice profit system chasing and fining or jailing non violent pot offenders. Gov greed is gonna keep the black market alive and healthy. What I’d like to know is how the safety and quality of cannabis products will be ensured. There is a HUGE difference between a plant with, say, 10% CBD and 5% THC one one with 30% THC and no CBD. They will have entirely different psychotropic and potential therapeutic effects, and user must know what these contents are. Without regulation and labelling, it would be like going into a liquor store and all the bottles have no labels. So you take a bottle to the man running the store and ask what it is, and your answer could be “who knows?. Could be 80 proof whiskey, could be beer. It all liquor isnt it?”. In addition, consumers must know if whoever grew the stuff added pesticides, hormones, etc etc because you dont need those things getting in you. In Canada, where medicinal cannabis has been legal for several years, only licenced providers can grow and sell it (to a person with a prescription from a licensed MD), and are under very strict controls- they must have their product analysed by an approved lab, for THC/CBD/Turpene content and it also must be assayed for about a dozen chemicals that are not allowed. If small growers want to have a vertical market, they must be prepared to follow the same standards, and that costs money. Clearly you haven’t been into a med or even adult access cannabis shop in the US yet…everything is clearly labeled with percentages of all THC,THCa, CBD, CBN, etc. Budtenders seem knowledgeable (at least in med dispensaries) on what products alleviate what symptoms. It’s not at all like a “liquor store with no labels”.